Single continuous line drawing of Barn Owl onto Wet on Wet watercolour. Mick Burton continuous line artist, 2015. This Barn Owl painting will be one of my eight pictures on display at the Harrogate and Nidderdale Art Club Autumn Exhibition in Ripley Town Hall, near Harrogate, on 21 & 22 November 2015. I then intend to submit it to the next Association of Animal Artists Exhibition. Harrogate and Nidderdale Art Club exhibition at Ripley Town Hall, near Harrogate, 21 & 22 November 2015. Visiting demonstrators at art clubs are amazingly varied and it is usually useful to attempt whatever they ask the club members to do. I have done some workshops myself and appreciate the efforts of club members who really have a go at continuous line drawings, and associated things I show, even though to is unlikely that any of them will take up my technique as a main style. Hopefully people can pick up things which can apply to other styles, such as building abstract patterns, using colour sequences, drawing key identifying parts of a subject and trying to manage a picture which sometimes appears to be drawing itself ! Charles Kelly from Bradford, who I have seen doing demonstrations before, came to Stainbeck Arts Club a couple of months ago and said he was doing a workshop this time. Watercolour tends to be the most popular topic at art clubs, but Charles has a spectacular approach to “wet on wet” and this time we were doing it too. Here is an example of his work from a demonstration to Alwoodley Art Group in 2013. 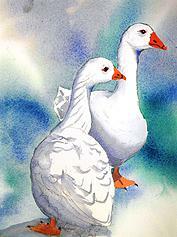 A Pair of Geese, painted by Charles Kelly in a demonstration at Alwoodley Art Group in 2013. My usual style of strong lines and flat colours (acrylic or poster colour) are poles apart from watercolour but I always learn something. I have to say that using a big brush to coat large proportions of the paper with water in advance (up to selected boundaries of course) and then squeezing brush loads of watercolour in dollops all over is a bit “hairy”. Then picking up the paper and waving it about so that the colour swishes around, like tides on a beach, reminds me of relatives of mine “panning” for gold in Victoria in the 1850’s. Charles had brought many reference pictures which we could use and I chose one of a barn owl. I thought that I could do washes up to the outline of the owl and also within the owl and later put a continuous line on top which more or less matched the washes. Here is a copy of the wash I did initially, helped by some tips from Charles along the way. 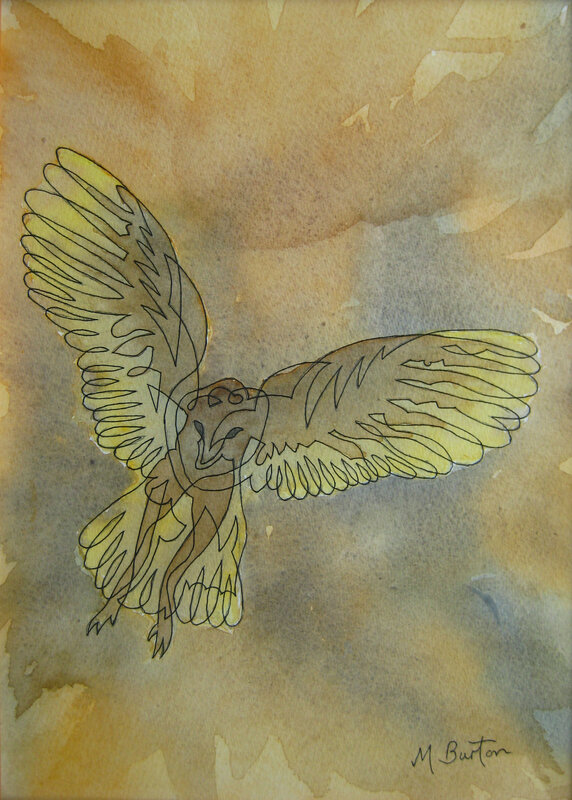 Copy of Wet on Wet watercolour of Barn Owl, before I attempted the continuous line drawing. Mick Burton. Later, at home, I worked on the continuous line on top of the above copy. I started by putting key lines along the outline of the owl, feathering and other features – to match the borders of colours as far as I could. Then I added more connecting pattern and finally joined everything up and made sure I had a continuous line. Once I was satisfied with this I traced the continuous line down onto my watercolour painting and drew over the lines in acrylic pen making final changes as I saw how the firm line was developing. I think that the translucent effect of the feathering has worked well, although this view may not be appreciated by a victim mouse in its last moments. 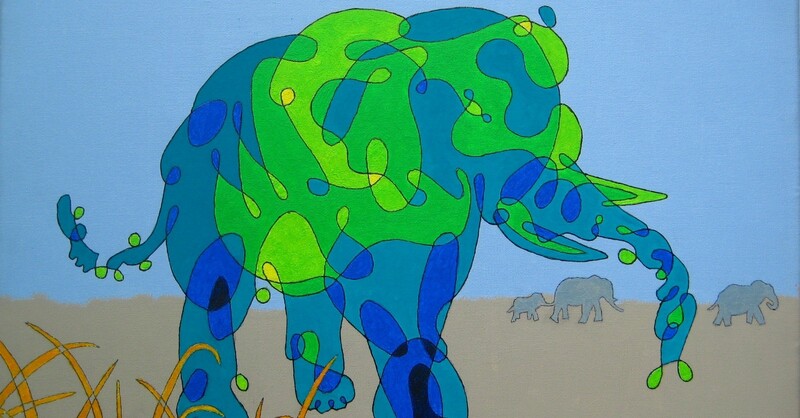 This entry was posted in Animals, Exhibitions and tagged abstract continuous line, Alwoodley Art Group, animals, Association of Animal Artists, barn owl, Charles Kelly wildlife artist, Continuous Line, continuous line blog, Continuous line drawing, Harrogate & Nidderdale Art Club, key lines, Mick Burton continuous line, Mick Burton continuous line blog, mick burton leeds artist, Mick Burton Yorkshire artist, Stainbeck Arts Club, translucent effect., watercolour, wet on wet on November 14, 2015 by mickburton2. Four Colour Theorem continuous line overdraw. My recent post about the formation design used by the record breaking skydivers included a continuous line overdraw of their design (modified slightly be me to complete links which would have been present with more skydivers). I said that I would explain how the overdraw (above) was completed. The structure is made up of circles which have 3 way junctions throughout (3 handed in the case of skydivers ! ). This can be regarded a map and so I will apply my Four Colour Theorem continuous line overdraw which I devised in the early 1970’s. I was trying to prove the Four Colour Theorem, which states that no more than four colours are required to colour all the regions of a map. My basic idea was that drawing a single continuous overdraw throughout a map would split it into two chains of alternate regions, which would demonstrate that only 4 colours were required. If more than one continuous overdraw resulted then there were still only two types of chains of alternate regions. As you will probably know, this theorem has many complexities which I will not attempt to cover here. In the mid 1970’s I corresponded with two mathematicians at the Open University about my approach, Robin Wilson and Fred Holroyd, who were both very helpful and encouraging. The theorem was proven in 1976 by Kenneth Appel and Wolfgang Haken, running one of the biggest computers for over 1000 hours. I soon decided that it was time to go onto other things! 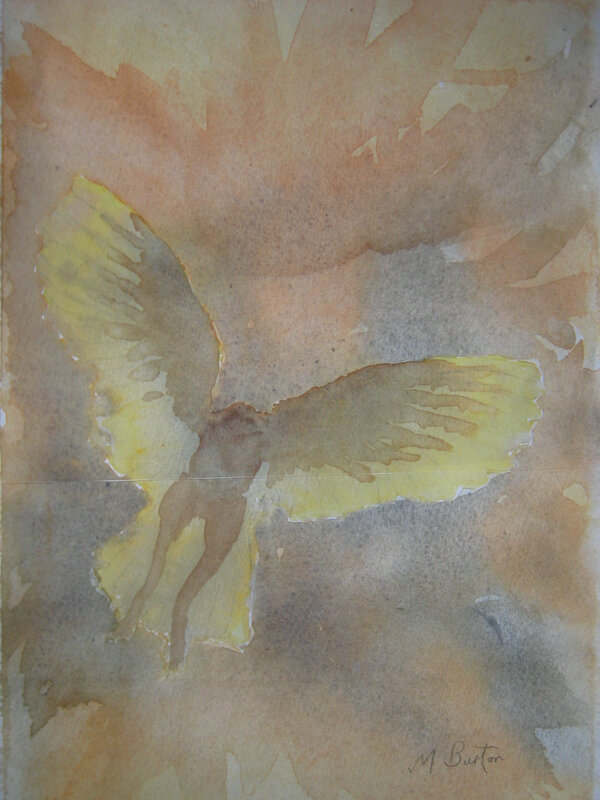 However, my journey had been fascinating with numerous amazing findings which have been so useful in my art. I can keep to relatively simple methods for my pictures. 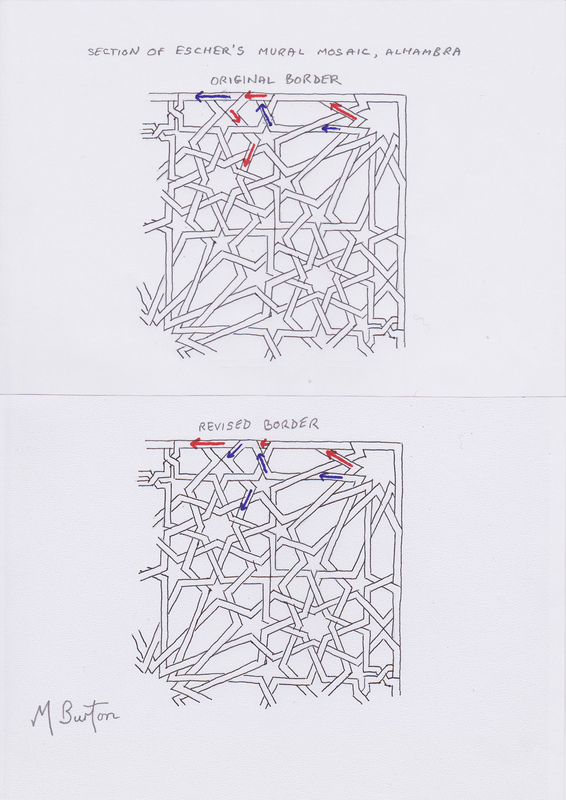 Here is the design, used above, with my initial overdraws shown in red. Assumed formation design used by Skydivers, with initial overdraws. Mick Burton four colour overdraw. On final completion of the overdraws, every junction should have two of its three legs overdrawn and so the start decision (1) above overdraws two legs and this means that the third leg, which I call a “spar”, links to another junction where the other two legs must be overdrawn. We then carry on making decisions which trigger other overdrawn lines across spars. Usually there is a “knock on” effect where new overdraws connect with already overdrawn lines which then trigger more overdraws. If we go wrong and a junction is triggered which has all three legs overdrawn, or none, we have to go back and change earlier decisions in a controlled process. I usually photocopy the overdraws completed, every two or three stages, so that going back is not too time consuming. Here is the situation after decision (3). Decision (2) in blue had only triggered two overdraw sections but decision (3), in green, has triggered ten sections to be overdrawn in green. Four Colour Overdraw decision 3 triggers 10 further overdraws, in green. Mick Burton, continuous line artist. Here is the completed overdraw. It can be seen that some decisions still only trigger one or two overdraws, but decisions 5 and 7 triggered 13 and 12 overdraws respectively. There are 80 junctions in the design and it took 11 decisions to complete the overdraws. completed Four Colour Theorem overdraw, on design based upon Skydivers formation design. Mick Burton, continuous line artist. The completed overdraw has several continuous overdraws. I tried other variations but had to accept that this design cannot be overdrawn with a Single Continuous overdraw. This is due to the design having basically only two full rings of circles, which means that some tips of petals cannot be included in a continuous overdraw. 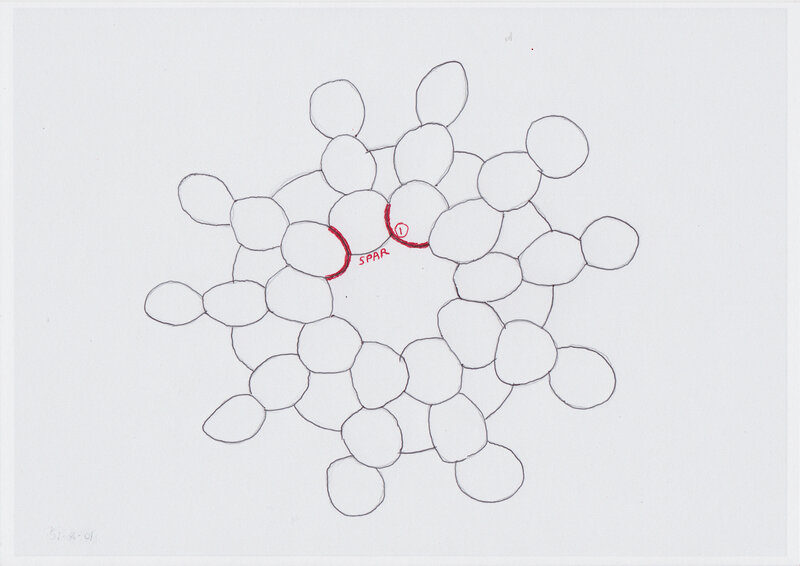 This situation can be overcome by adding links between the tips of the petals to produce that extra ring of areas. Here is the expanded design and the stages of overdraw. I managed to complete the Single Continuous overdraw in one sequence without having to go back to change any decisions. Increased size design with successful Single Line Overdraw using Four Colour Theorem method. Overdraw decisions shown. 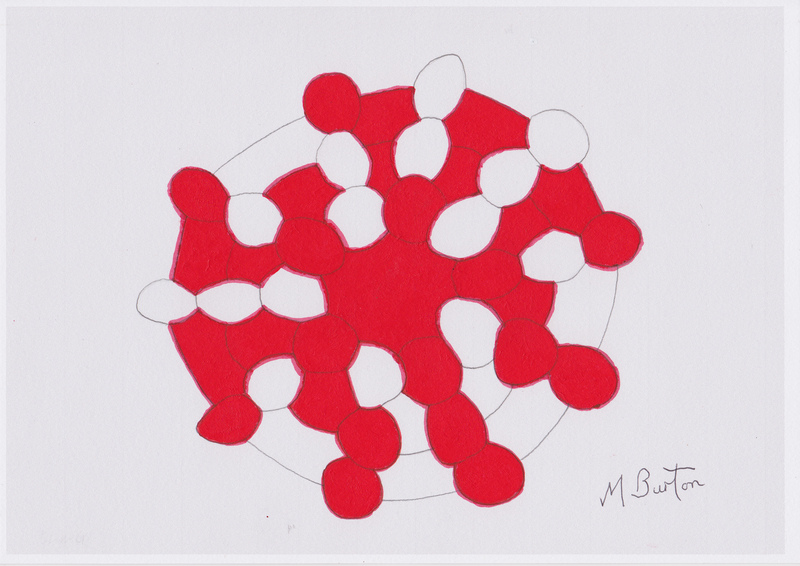 Mick Burton. Of course it looks better with one solid colour overdraw and no decision numbers. Skydiver formation design with links between out petals completed, overdrawn with a Single Continuous Line using Four Colour Theorem method. Mick Burton. I have said that the method of overdraw was developed with Four Colours in mind, and so you could use one pair of colours alternately within the above overdraw and another pair of colours on the outside of the overdraw (which can include the background). I have found another interesting result in that if you use strong colours inside the overdraw, as it is the main image, and neutral colours outside (or even leave the outside blank) then the gaps between the “petals” show good use of space. Here is the design simply coloured in strong red inside the overdraw, which creates a good contrast as the background seeps in. Solid colour within single continuous overdraw, with Four Colour method, showing good use of space. Mick Burton. The chains of areas produced by the continuous overdraws can be coloured, not just in two pairs of colours to demonstrate Four Colours, but with a colour sequence or a mixture of sequence, alternate colours or even one colour. In the last picture I have used colour sequence on main chains of areas related to the central space and, as a contrast, light grey on the chains connected to the outside of the design. 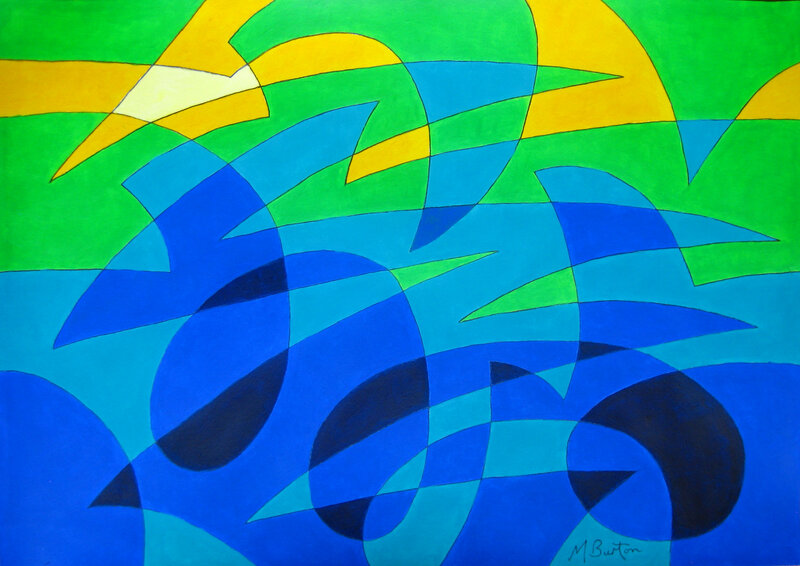 This is one of the first paintings that I produced after discovering my Four Colour Theorem overdraw in 1971. I called the picture “Star Burst”, one of my first planetary pictures. This entry was posted in Abstract, My Styles of Drawing and Colouring and tagged Abstract, abstract continuous line, Appel and Haken, chains of areas, colour sequence, Continuous Line, continuous line blog, continuous line overdraw, Four Colour Map Theorem, four colour theorem overdraw, Fred Holroyd Open University, Kenneth Appel and Wolfgang Haken, Mick Burton, Mick Burton continuous line, pair of colours, planetary paintings, proof of four colour theorem, Robin Wilson Open University, single continuous line, skydivers formation design, spar between junctions, star burst, three way junction, trigger overdraws, two chains of alternate colours, two legs overdrawn, use of space on August 18, 2015 by mickburton2. Spherical Continuous Line Abstract with Colour Sequence. Spherical single continuous line drawing with colour sequence. Flypast Over Rolling Hills. 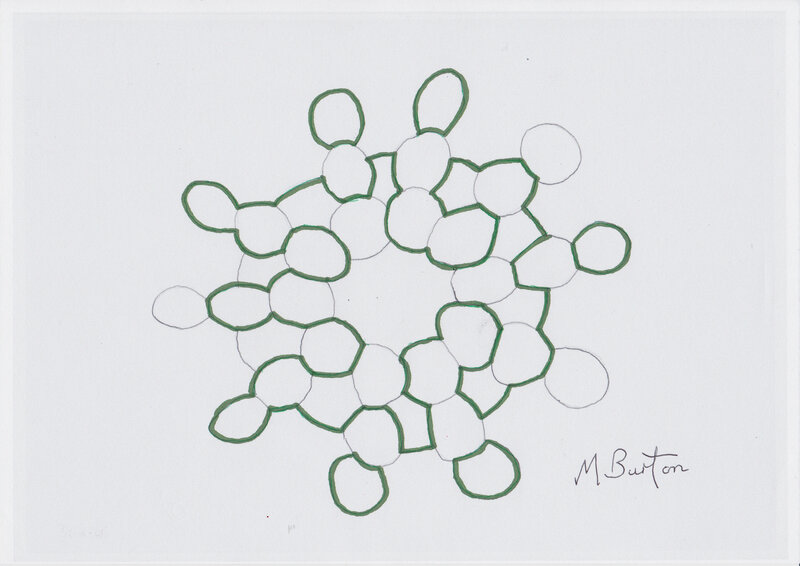 Mick Burton, continuous line artist 2015. 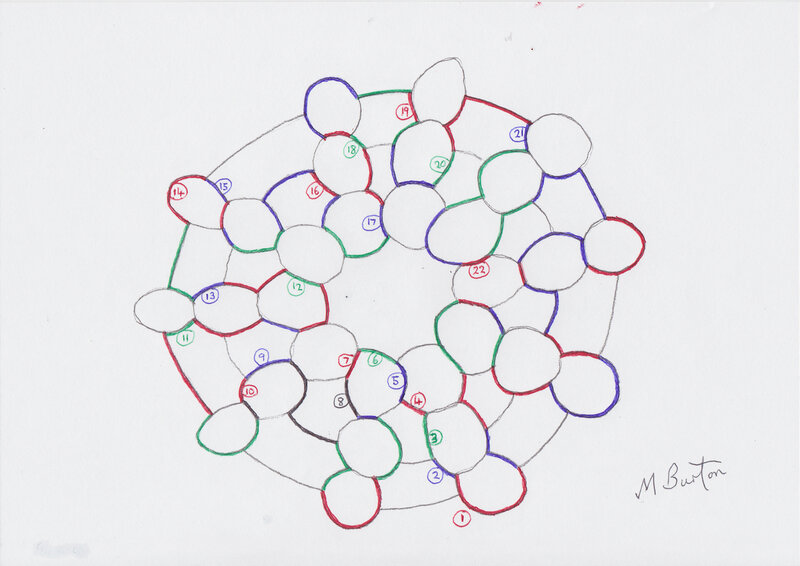 I have modified my Spherical approach to continuous line from the method I described in my Continuous Line Blog post of 9 July 2014, which did not quite reflect the reality I was seeking. I have kept the idea that when you draw out of one SIDE of the paper you need to return at the opposite SIDE at the corresponding point, so that the pattern matches vertically and after colour sequence the colours also match if you pull the paper round into a tube shape. This is similar to the equator on a globe of the world matching. Previously I had said that when going out of the top of the drawing you also need to return at the corresponding place at the bottom. I was correct to say that the colours would not match, which would be equivalent to the poles on the globe of the world not meeting, but the treatment of the lines needed to be modified. I realised that the bunching effect of the top being pulled together totally separately to the bottom being pulled together was fine regarding separate sets of colours but matching the line patterns from top to bottom was the wrong approach. So, when I go out at the TOP now I need to come BACK IN AT THE TOP at the corresponding distance from the other end of the top. Similarly if I go out at the bottom I come back in at the bottom. You could then imagine that folding the picture vertically down the middle would mean that both pattern and colour sequence would now match at the top and bottom respectively (don’t actual fold it and spoil the picture ! ). I recently drew the following for a demonstration/workshop at Stainbeck Arts Club in Leeds. I started drawing the line a couple of inches in from the top left side and did a few rolling curves diagonally down from left to right, followed by several exits and returns to the picture – initially out at the lower right side and back in at the lower left side, then down and out at the bottom left and back in at the bottom right. 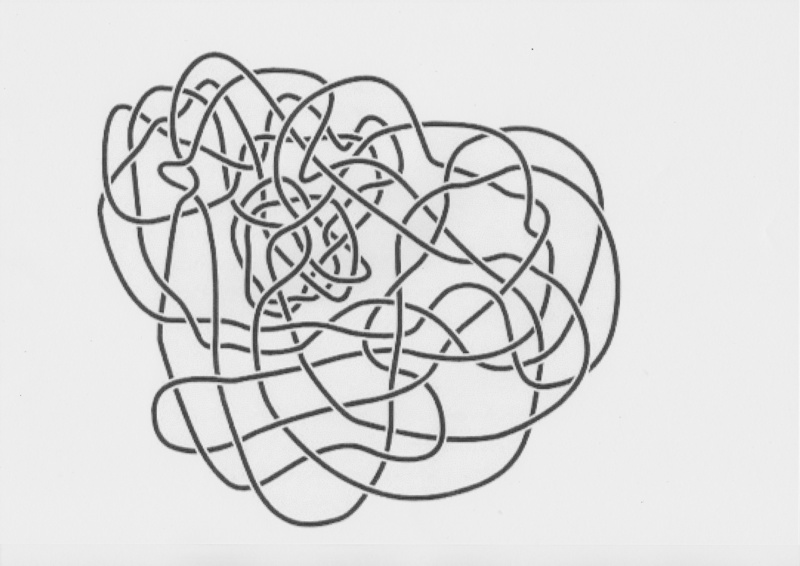 Spherical single continuous line drawing with rolling and jagged lines. 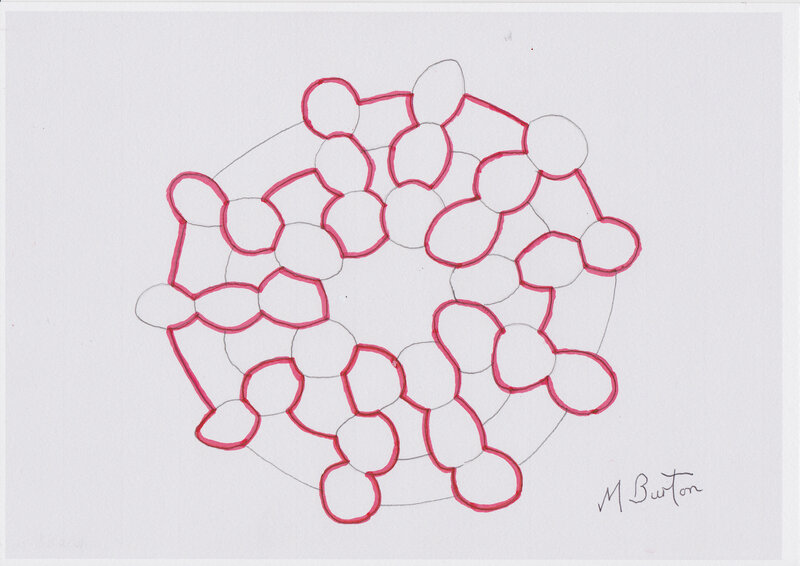 Mick Burton, continuous line artist 2015. I later tried some “shark fin” curves and a couple of large jagged sequences. 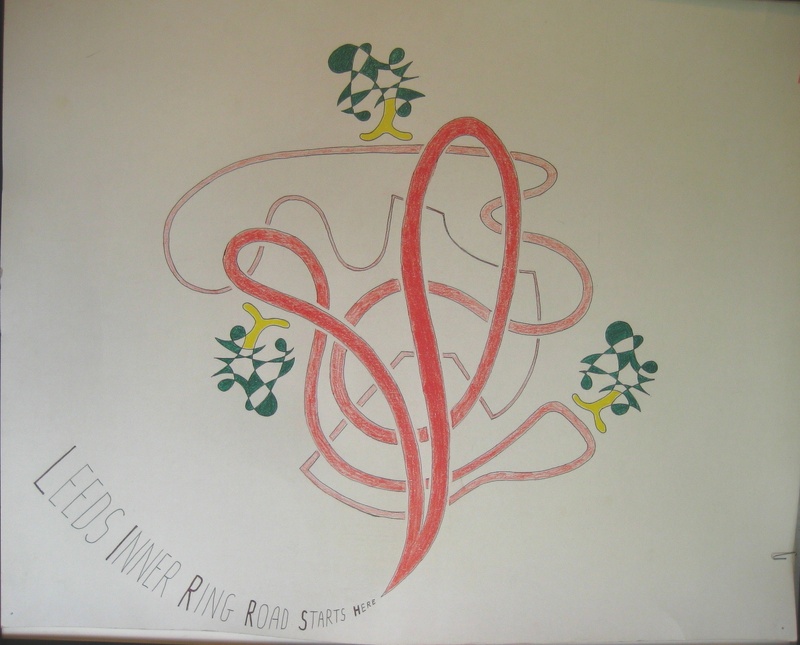 All the time I tried to draw the line cleanly through existing shapes (avoiding going near previous junctions) and being aware of areas I had not visited much. Finally I needed to work out how to get back to my start point without spoiling the composition too much (here going out and back in can be handy). I hope you can check the route of the line through the whole picture fairly easily. I then applied my Colour Sequence to produce the picture at the top of this post. The first stage is my usual alternate overdraw of the line (if you are overdrawing a section as you go out of the picture you need to continue to overdraw as you re-enter, or if not overdrawing going out it’s not overdrawing when you re-enter). See my post of 10 September 2014 for the full ALTERNATE OVERDRAW process and my post of 27 September 2014 for the COLOUR SEQUENCE process. I have used a series of 6 colours from Pale Yellow through greens to Prussian Blue which I have tried to work out in steps of tone. 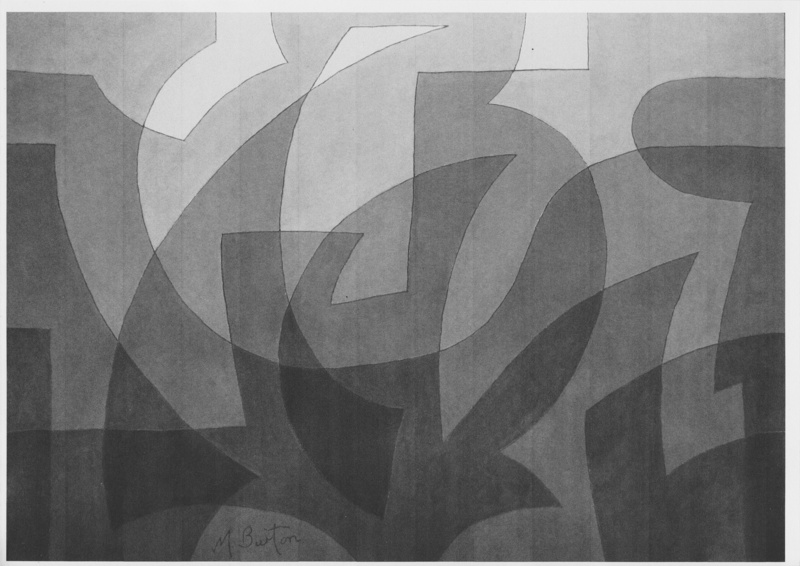 This is partly to highlight the overlap effect of continuous lines and the natural depth of the abstract. 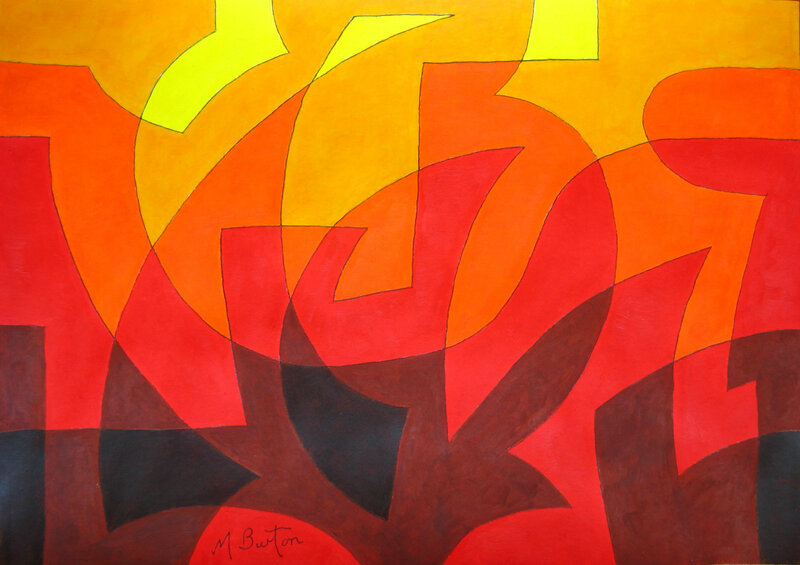 As always, there is choice of direction of colours – light to dark or dark to light. Here it seemed best to have the single lightest area at the top and several darker areas across the lower part of the picture. 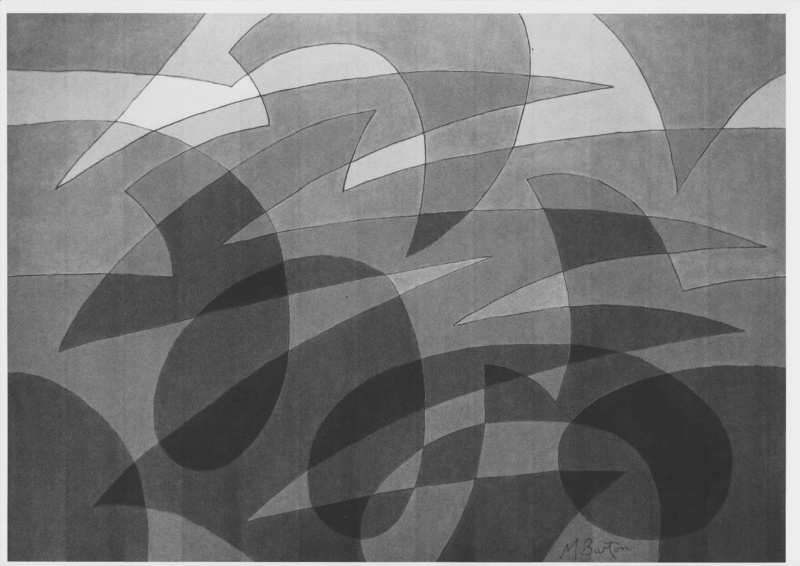 The picture also has an Optical Art look about it. Printing the picture in Monotone is usually a good way of checking the steps of colour and light to dark. So here it is. Monotone of Spherical Single Continuous Line Drawing “Flypast Over Rolling Hills”. Mick Burton 2015. I also produced another similar abstract for the Demonstration at Stainbeck Arts Club to show the Spherical approach with a different flow of lines and colours. I had coloured the drawing with a sequence from Yellow through Reds to dark Brown. 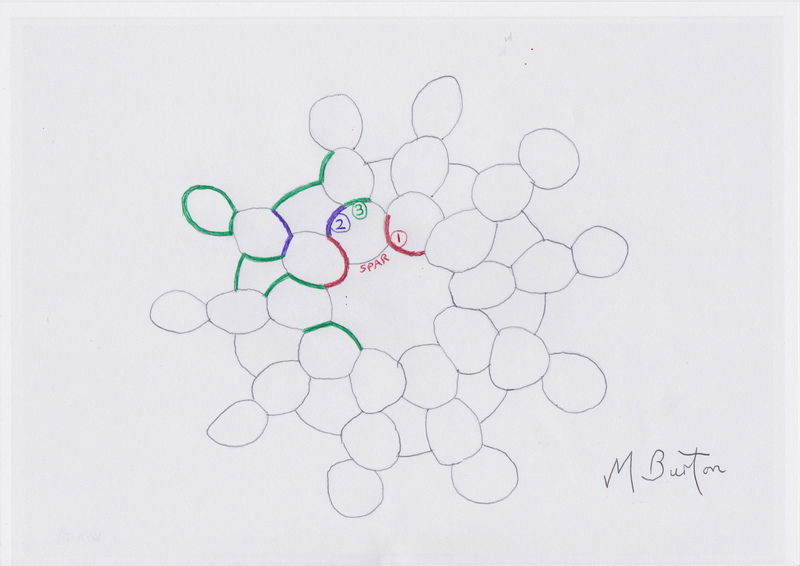 Spherical Single Continuous Line Drawing with Colour Sequence. Forest Fire. Mick Burton 2015. Here is the Monotone of this picture. Monotone of Spherical single continuous line drawing “Forest Fire”. Mick Burton 2015. This entry was posted in Abstract, My Styles of Drawing and Colouring and tagged abstract continuous line, Alternate Overdraw, black and white tone, colour sequence, colour sequence method, continuous line blog, Continuous line drawing, direction of colours, Mick Burton, Mick Burton continuous line, Mick Burton continuous line blog, mick burton leeds artist, Mick Burton Yorkshire artist, monotone, Optical Art, Spherical drawing on July 7, 2015 by mickburton2. Escher Islamic Mosaic Change to One Continuous Line. STAGE 5. 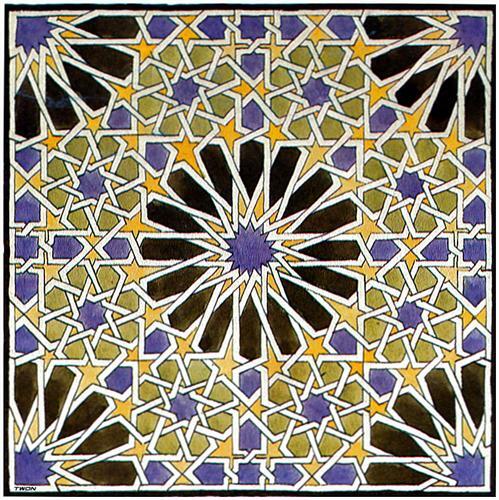 Escher painting 1922 of Islamic Mosaic tile at the Alhambra. WikiArt. 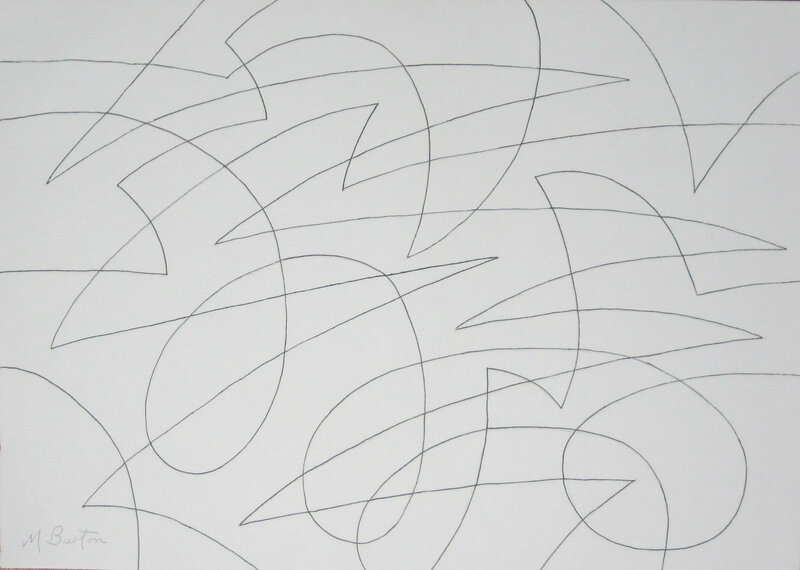 Continuous line study by Mick Burton. 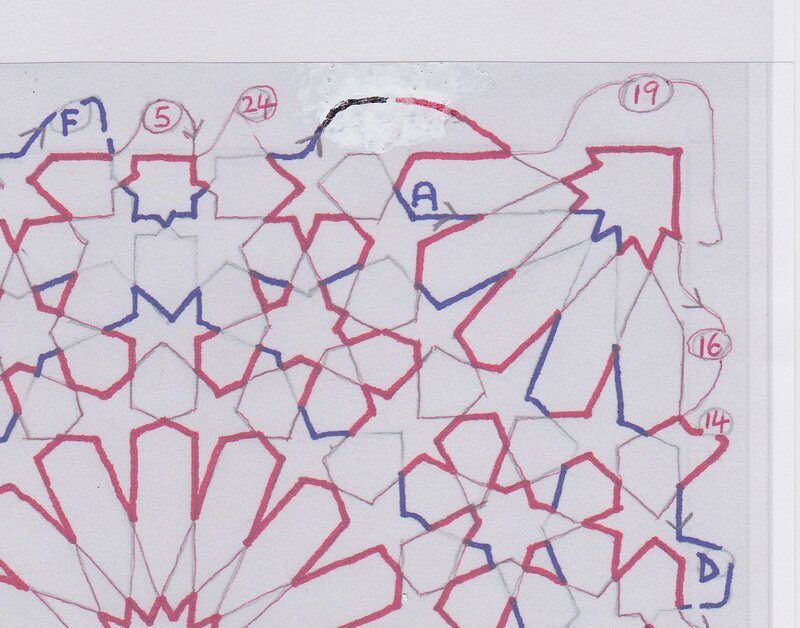 In my post of 4 April 2015, Continuous Lines in Escher Islamic Mosaic painting, STAGE 1, I mentioned that the original Islamic artist had deliberately created two Continuous Lines, when he could have just as easily created one, because he wanted to retain overall symmetry of design and border connections. I stated that I had examined the design and worked out how to make a change to the border connections of lines to create one continuous line throughout the design, and this is how it’s done. Here is the chart from STAGE 2 again, which shows the Main Continuous Line in Red and the Minor Continuous Line in Blue and the colours are also shown as the connections loop outside the Border. The change has to be done without changing the Alternate Overdraw in the main design and this is done by linking a Red Overdraw with a Blue Overdraw at the same time as linking two not overdrawn lines. 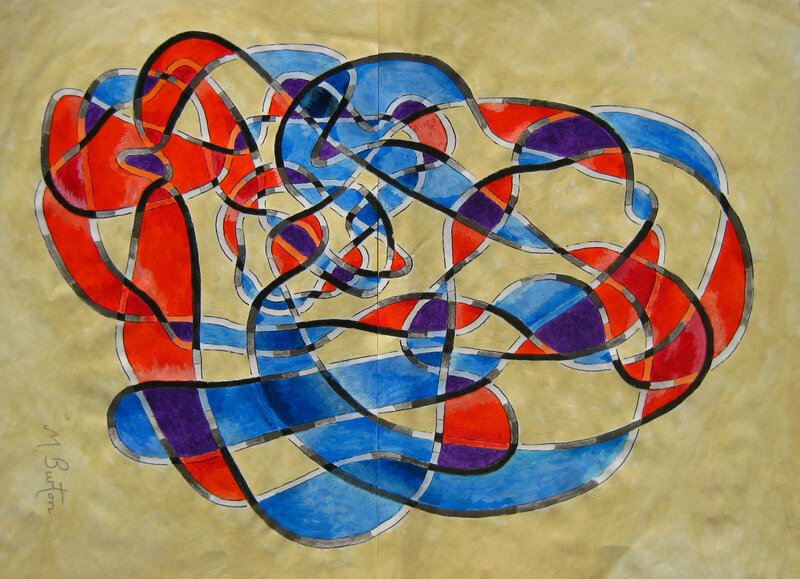 Minor Continuous Line, Alternate Overdraws in Red and Blue. 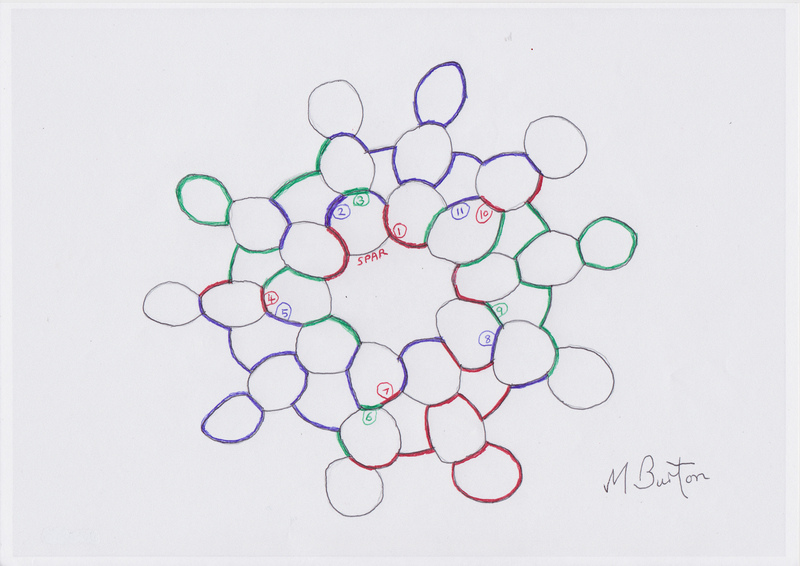 Mick Burton Escher Mosaic study. We need a crossover on the Border involving a Red loop and a Blue loop. If we part them at that junction and re-join the Red with the Blue, and then join both not overdrawn ends as well, we have united the Main and Minor continuous lines. See Below. Joining of Main Red Continuous Line to Minor Blue, leaving both non Alternate Overdraw lines joined at the former junction. 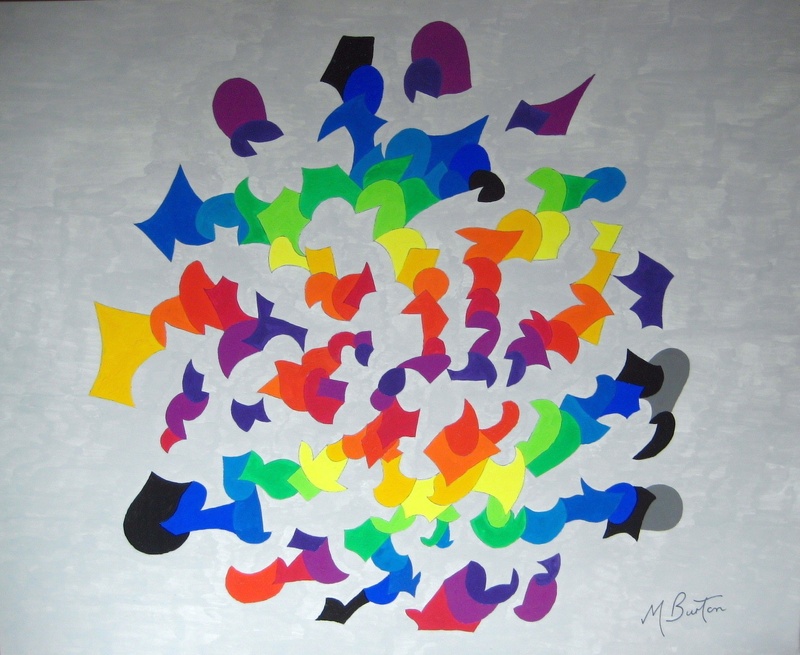 Mick Burton Escher Mosaic study. To show how this change is reflected in the Border, here is a before and after “Spot the difference” comparison which I have drawn. Change of Border on Escher Mosaic to enable one continuous line. Mick Burton study. As you can see, the difference between having two continuous lines and one is just a couple of flicks of a pen. Obviously, the artist would have known there was a one continuous line option and that he could have done it without losing any design or colouring options. Presumably, the artists were required to retain overall symmetry above all else, including in the Border. 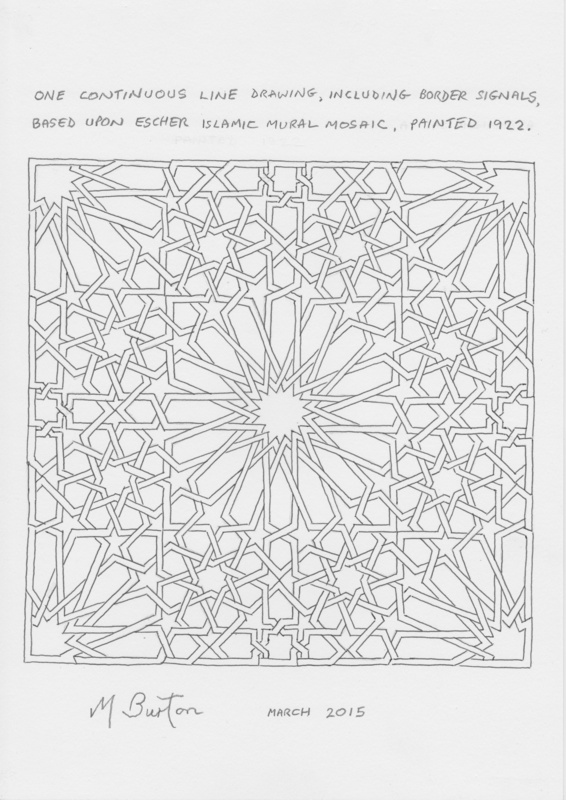 Eric Broug has also informed me that continuous line drawing is very rare in Islamic geometric design. After completing my research into the Escher painting, and explaining the one continuous line alternative, I realised that I needed to draw the single continuous line myself. Here it is. 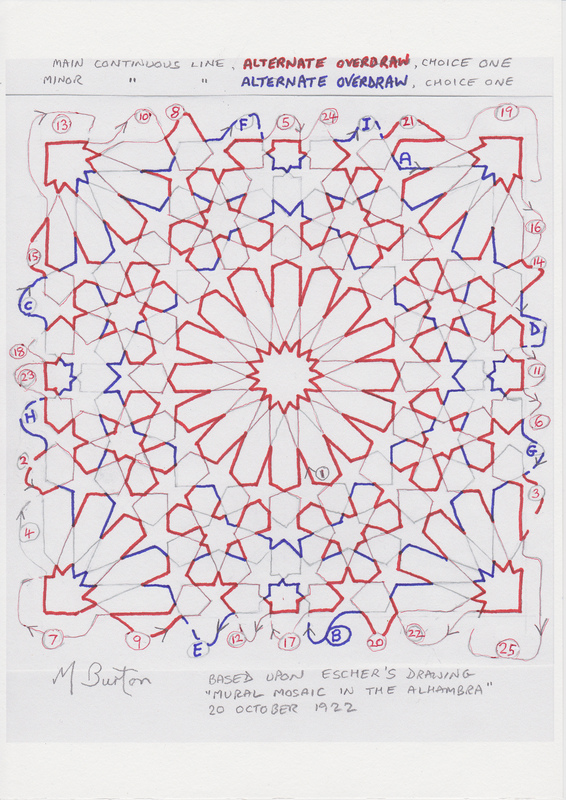 One Continuous Line Drawing, including Border signals, based on Escher Islamic Mosaic. Mick Burton, March 2015. This completes my five STAGES of explaining my thoughts on Escher’s terrific painting, in 1922, of the Islamic Mural Mosaic in the Alhambra. 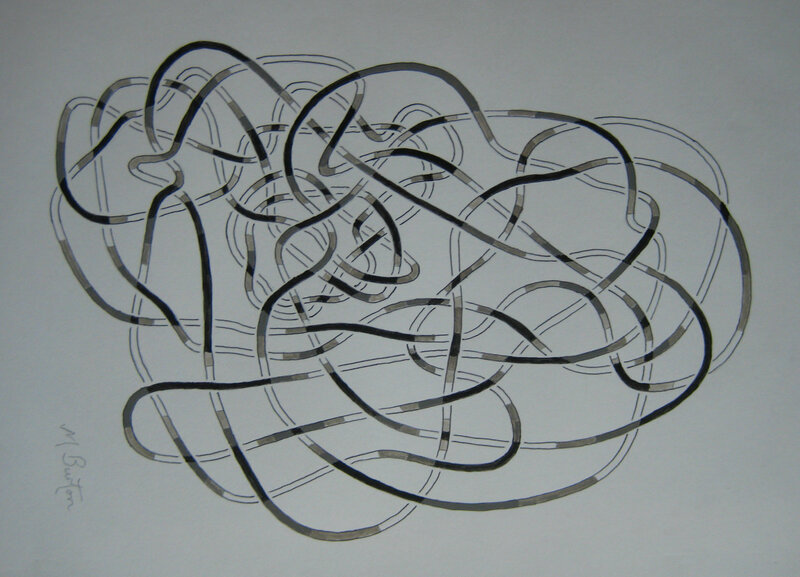 I hope you found this abstract continuous line it to be interesting and stimulating. Finally, I would like to thank Margaret Graves, Assistant Professor of Islamic Art and Architecture at Indiana University, for her encouragement and guidance after I completed my research. This entry was posted in Abstract, Famous Artists, My Styles of Drawing and Colouring and tagged Abstract, abstract continuous line, Alternate Overdraw, Border change, border connection, border signal, continuous line Islamic art, Eric Broug, Escher Islamic Mosaic, Indiana University, Islamic Art and Architecture, Islamic artist, Islamic geometric design, main continuous line, Margaret Graves, Mick Burton Escher Mosaic study, mick burton leeds artist, Mick Burton Yorkshire artist, minor continuous line, Mural mosaic, Not overdrawn line, One continuous line, overall symmetry, single continuous line, two continuous lines on April 9, 2015 by mickburton2.